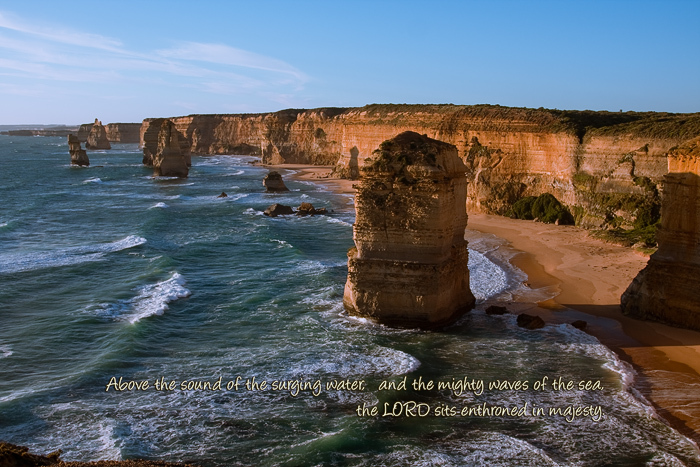 This canvas print is taken shortly before sunset on a glorious sunny day at the Twelve Apostles, located along the Great Ocean Road. A quote has been added from Psalms 93, reminding us that God's majesty is greater than even the most awe inspiring examples of creation. God is both literally and conceptually high above the waves that crash on the shoreline, slowly eroding the softer rock to produce spectacles such as the Twelve Apostles. Measuring 30 x 46 cm (12 "x 18"), this print uses high quality artistic canvas. The canvas is stretched with the image fully wrapped around a quality wooden frame. The canvas comes with nylon string for instant hanging. Other sizes are available upon request. This item is a special introductory offer, with very limited availability. Get in quick! Prices displayed are in AUD and will be converted to your local currency during checkout.